Georgia's Getting a Bigger Aquarium for a Bigger Fish...Sharks! The largest aquarium in the United States is getting bigger. Georgia Aquarium revealed expansion plans today for a new gallery featuring sharks --one of the most misunderstood species in the ocean-- to open in late fall of 2020. 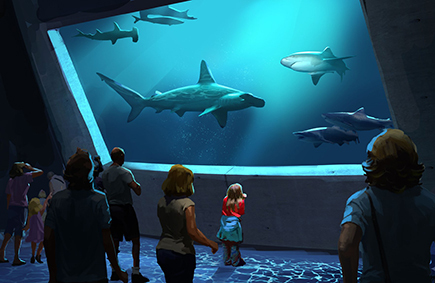 The project, Expansion 2020, is a major addition to the Western hemisphere’s largest aquarium featuring a shark habitat and redesigned entry. The saltwater gallery will feature stunning floor to ceiling acrylic windows to give guests an up-close and personal view of these majestic animals. Potential shark species under consideration include hammerheads, sand tiger sharks, and sandbar sharks. Additionally, a number of animal interactions are in the works for the new exhibit, which will give guests the opportunity to get even closer to some of these fascinating animals. Once finalized, more details on these interactions will be released. The Aquarium’s focus is to provide a fresh perspective on the vital role sharks play in our oceans’ health. Sharks face many challenges like overfishing and habitat degradation. Humans pose the biggest threat to sharks and through this new engaging exhibit, guests will learn more about these apex predators and their importance to our ocean. The expansion will add tens of thousands of square feet to the Aquarium that also includes extending the main entrance out into the plaza. Construction will begin in April and a temporary entrance will open in September for guests during construction.